Here is a graphic showing the head-to-head records (all matches in blue, grand slam matches in green) of some top men’s singles tennis players of recent past and present. A line joins two players if they have played at least 8 times. The thicker the line joining two players, the more often they have played against each other. The image is current to the end of 2012 2013. The pairs with the most matches between them are Lendl-McEnroe, followed by Edberg-Becker and Lendl-Connors. The trio with the most matches between them is Connors-Lendl-McEnroe which is hardly a surprise given their careers overlapped heavily (despite Connors starting much earlier) and they lead the list of most ATP singles titles won in the Open era (109, 94, 77 respectively). 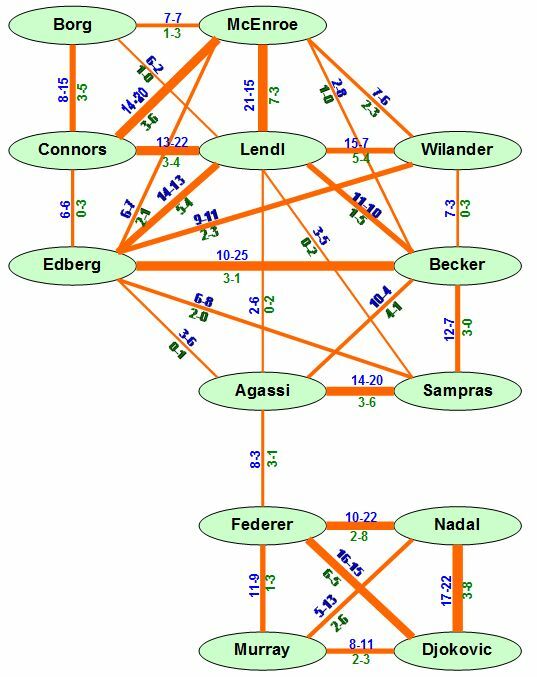 A reason for generating the graphic was to see how the current quartet of Federer-Nadal-Djokovic-Murray compares with quartets of the past. These four have been ranked 1 to 4 in some order for 141 of the past 155 weeks (to the end of 2011). Curiously all of Murray’s grand slam matches against Djokovic and Federer have been in finals, while none of his 7 grand slam matches against Nadal were in a final. It looks like the previous quartet to stay at the top for so long was McEnroe-Lendl-Connors-Wilander who were in the top 4 in some order from 1983 to 1986. Interestingly Connors and Wilander only met 5 times since they would have been in opposite sides of the draw for much of that time (ranked 3 and 4), much like Murray and Djokovic prior to this year. In terms of matches played the biggest quartets here appear to be Lendl-McEnroe-Connors-Edberg and Lendl-McEnroe-Wilander-Edberg (where at least 13 matches were played between any pair). It will be fascinating to see how the present-day quartet ends up. Also of note is that all of Wilander’s 3 career wins against Becker came in grand slam matches. Becker also had losing records against his other main foes in grand slam matches except for Lendl. Edit: here is how the image looks as of the end of 2016 2018. Nice post CK! That was a great way of showing all the head-to-heads, so you can see the contemporaries as well as the successive generations.